Before I moved to New York, I lived near Hoxton Square in London. If you’re not familiar, this is a small garden square in the East End surrounded by restaurants and bars. On one corner, there is an ever-changing restaurant space. In my experience with the area (around 3 years now), the cuisine has shifted from tapas to Indian to sushi and now it’s an American BBQ place called Red Dog Saloon. Near the adjacent corner used to sit a restaurant called Miso Noodle Bar, which Husband and I loved. It was our “go-to” place when we wanted crispy duck, noodles and a cheap bottle of decent wine. 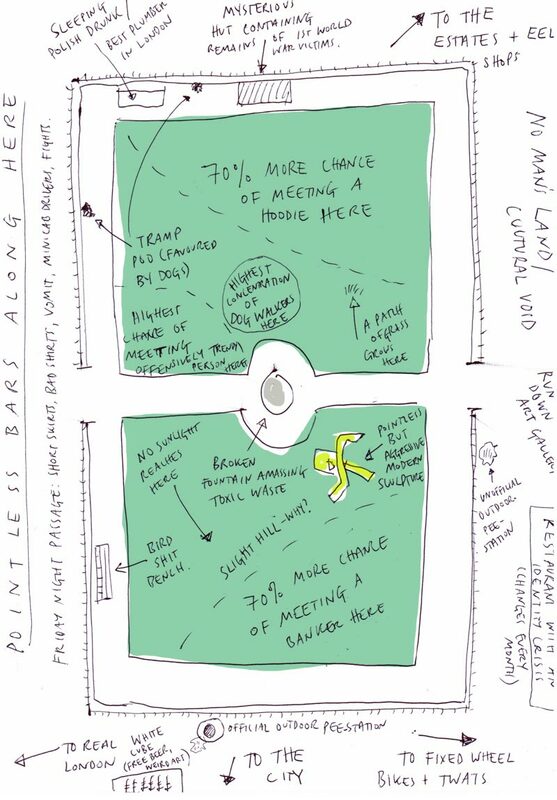 On the rather whimsical map below, Red Dog Saloon is located at “Restaurant with an identity crisis” in the southeast corner, while Miso’s spot is across from “Official Outdoor Pee-station” at the south end of the square. When I saw this past May that Miso was shut and being replaced by a hamburger place I was torn. On the one hand, my old friend Miso….gone. On the other hand, it was being replaced by an establishment serving my beloved hamburgers. At the end of the day, I was keen to try it. Loyal I am not. I ordered the Cheeseburger with Emmental cheese and regular fries (as opposed to skin on, which I find detestable). I must admit I didn’t have high hopes for the burger. 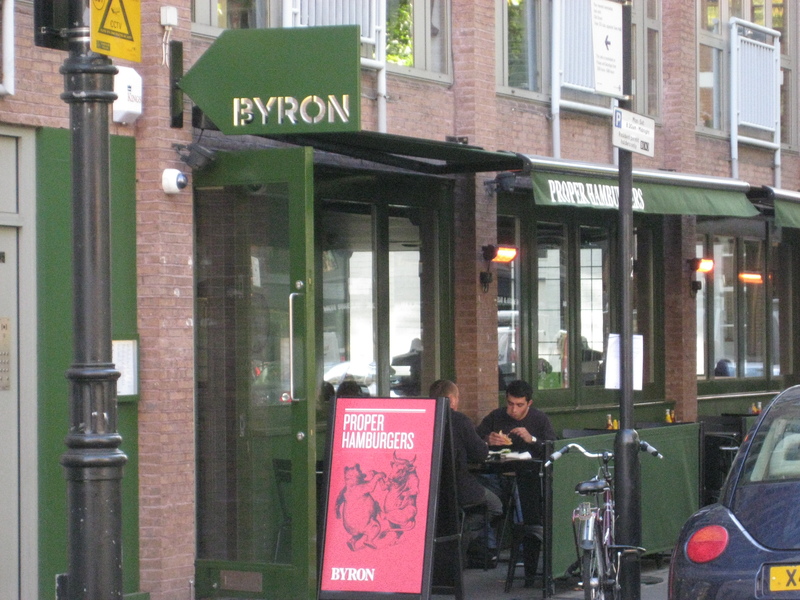 London isn’t really a burger town, and Byron is a fairly new chain about which I hadn’t heard much. But I did like the environment. The décor is sort of upscale diner meets gastropub, and the service was friendly. At the risk of sounding like my parents, I will point out that the music was quite loud – I wouldn’t want to try to have a conversation there at night. Unless I’d been drinking. Because then everything said is pretty much just rubbish anyway. 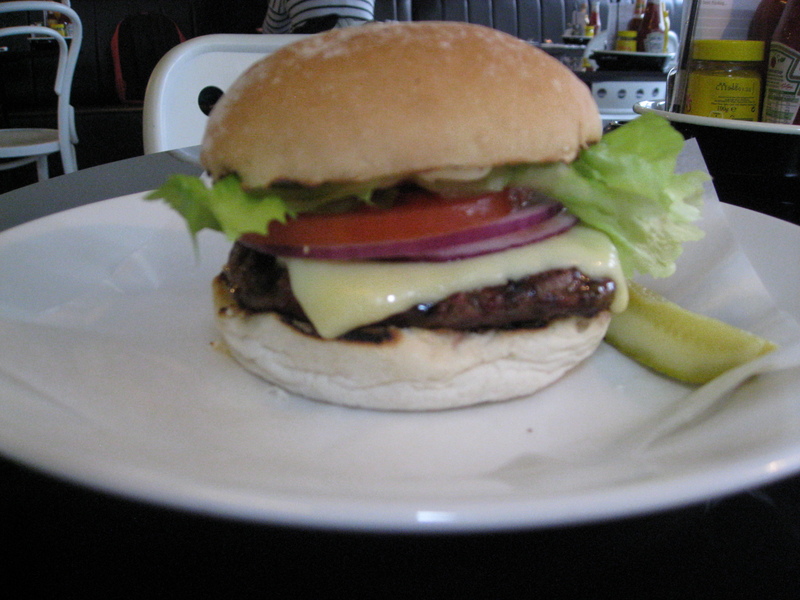 The burger was good – fresh, high quality Scottish beef with a nice grilled note – though there was no particularly standout meaty or complex flavor. It was topped with mayonnaise, lettuce, tomato and onion, and served on a standard white bun. The chef at Byron cooked it medium, as promised, and the cheese had a nice sharp Swiss flavor. All the ingredients worked in balance and that’s always nice. 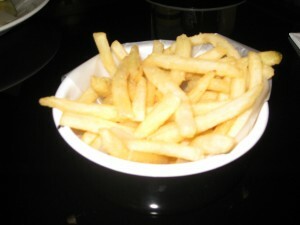 The fries were pretty much exactly the way I like ‘em – thin & crispy, not too salty. Like McDonald’s fries without all the sodium. Destination Burger: Yes, Byron is worth checking out if you’re in town. Optional French Fry Rating: Tasty. Fat and Calorie Worthy: Probably. Today’s Weigh In: Down 3 lbs. since last post. Many thanks for your article! I really enjoyed it.